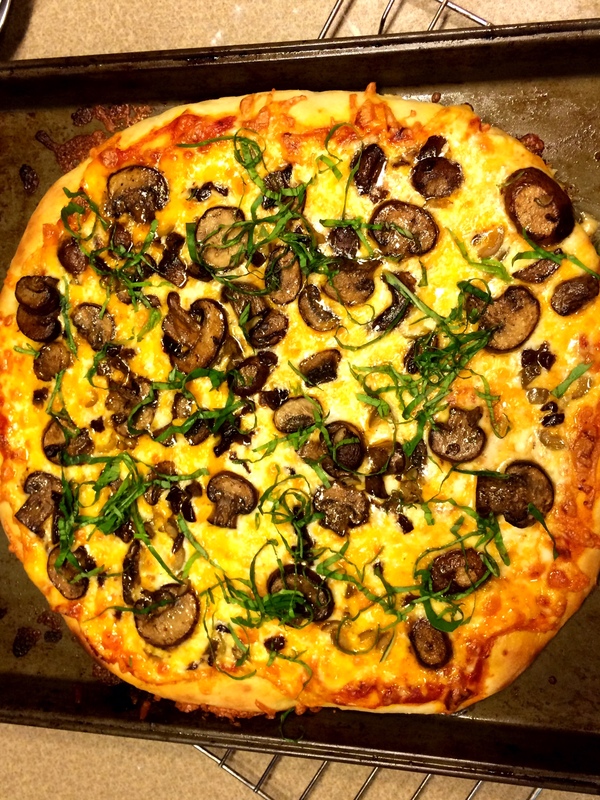 Homemade Pizza with Mushrooms, Squash, and Brussels Sprouts – One Half Indian. Today was my nephew’s (half) birthday. I have to say, it was pretty spectacular (better than some of my real non-half birthdays). We had ice cream cake from Cold Stone and homemade pizza for dinner. And lots of balloon games that had very intricate rules made up by my nephew. Much fun and many calories were had by all. The pizza dough recipe was from Bobby Flay and the pizza recipe came from what was in the fridge. 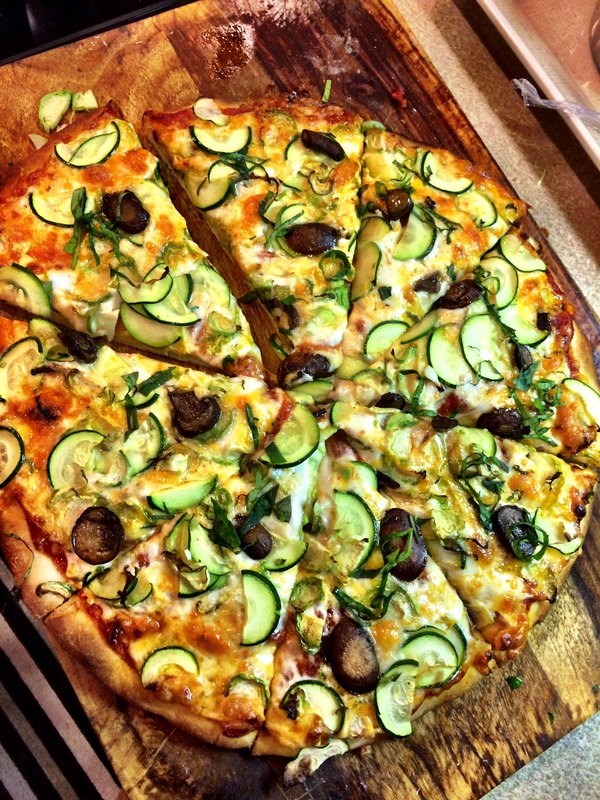 We used mushrooms on the first pizza and brussels sprouts with squash on the second pizza. For cheese, we mixed grated mozzarella and a spicy grated cheddar. 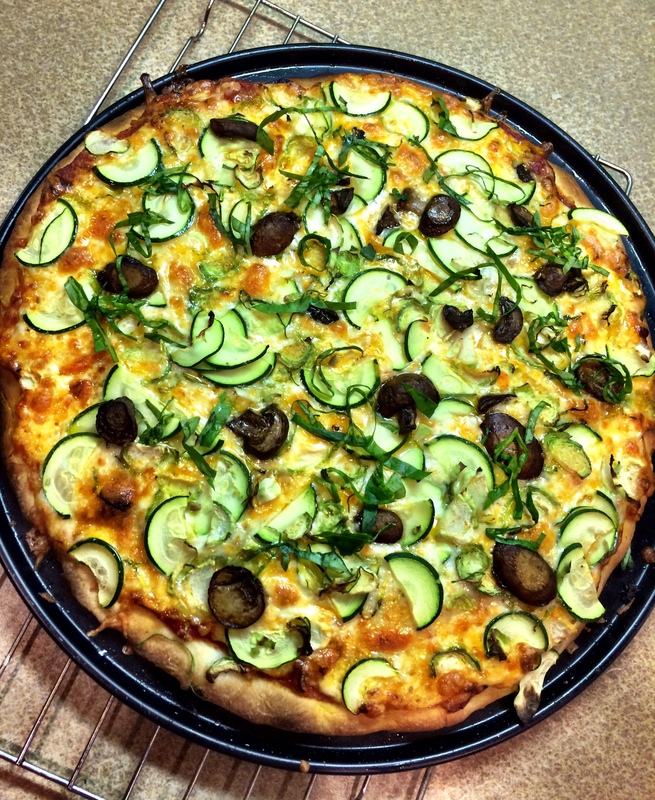 Each pizza was topped with fresh basil after coming out of the oven. To cook the pizza, you want a really hot oven. I read several other blogs on pizza before making this, and most people kept saying to get the oven as hot as it goes. My oven went to 550 F, so that was the cook temperature. You can’t really go wrong with this recipe, but it may take a few tries to get the crust to be to your desired crispy-chewy balance. This dough recipe will make two 14 inch pizzas. You can store the dough in the fridge for up to a week. 1. Combine flour, sugar, yeast, and salt in a mixing bowl. Mix all dry ingredients together so that they are evenly distributed. Add olive oil to the mix. Slowly add the water while stirring. If you have a stand mixer with a dough hook, use that for this step. We did not, so we did it by hand. Continue to incorporate the water until the dough forms into a ball. it will be a tiny bit sticky, but should not be wet. If dough is too wet, add some flour. If dough is too dry, add a tsp of water. Dough consistency will vary depending on the grain of the flour and your climate. 2. Turn the dough out onto a floured surface. Gently knead the dough into a smooth firm ball. 3. Grease a large bowl with 2 tsps of olive oil. Add the dough and cover the bowl with plastic wrap. Let the bowl sit in a dry, warm place to double in size, about 1 hr. 1. Preheat oven to 550 F.
2. Place round dough ball on greased pizza pan. (You can of course use a pizza stone for this. We used a pan.) Push fingers into dough to flatten the dough. Begin pushing in the center and work your way out to the edges. If the dough keeps snapping back to the center, let it rest for 10 mins and then go back to pressing it out. Press until the pan is covered or the dough is approximately 14 inches. Make sure all bubbles are removed from dough. 3. 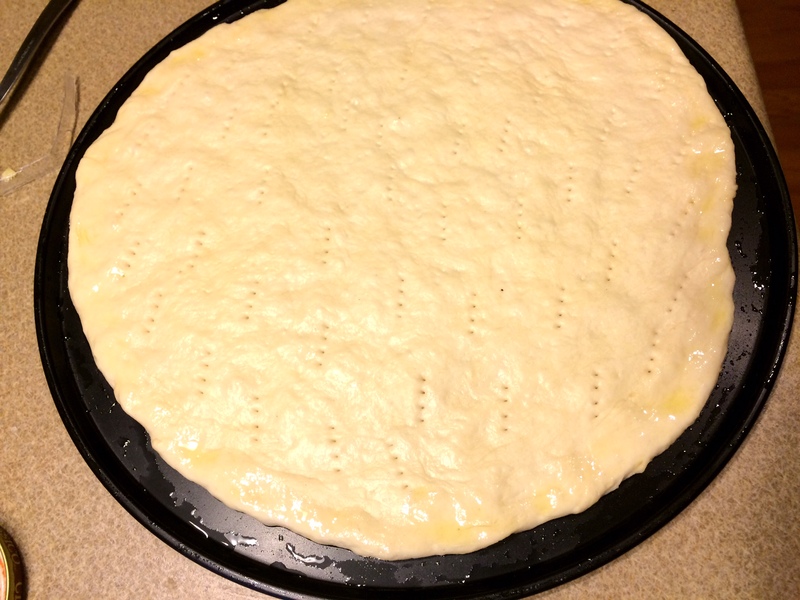 Use a fork to poke holes all over the dough. 4. Bake the pizza crust on its own for 2.5-3 minutes. 5. Remove crust from oven and cover with sauce, cheese, and veggies on top. Place pizza back in oven and cooke for another 7 minutes. 6. Turn the oven to broil and cook one minute longer. 7. Remove the pizza. Top with chopped basil and let cool at least 5 minutes before slicing. YUM, this looks fantastic. I agree about the hot oven. The crust is so much better! Yes! The hot oven gave the crust the crunchy outside while staying perfectly chewy in the center. Pingback: Stromboli and Pan Pizzas | One Half Indian. Pingback: Savory Bread and Tiny Visitors – One Half Indian.